Jon Cline, an avid bike commuter from Vienna, answered FABB’s brief survey questions while participating in Bike to Work Day 2017 at the Tysons pit stop. Jon: I just love biking. 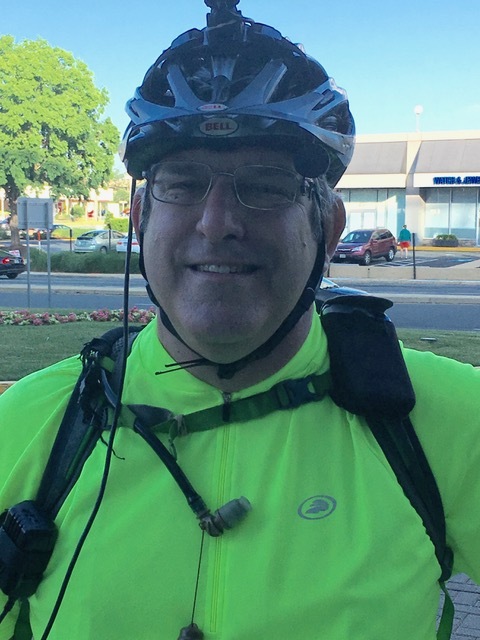 Jon: I regularly commute by bike to my work in McLean. I try to Bike wherever I go, so I’ve been using BikeShare when it is available. For fun and on weekends, I will bike out to Purcellville on the Washington and Old Dominion Trail. Jon: I love being outside and being active. It’s a great way to get exercise. VDOT and NOVA Parks recently installed a warning device at the W&OD Trail crossing of Sterling Blvd in Loudoun County to encourage motorists to yield to trail users. Today (Tuesday, July 25) Loudoun Sheriff's officers were issuing warnings to motorists who stopped for trail users at the crosswalk. Officers said they would be issuing citations soon. 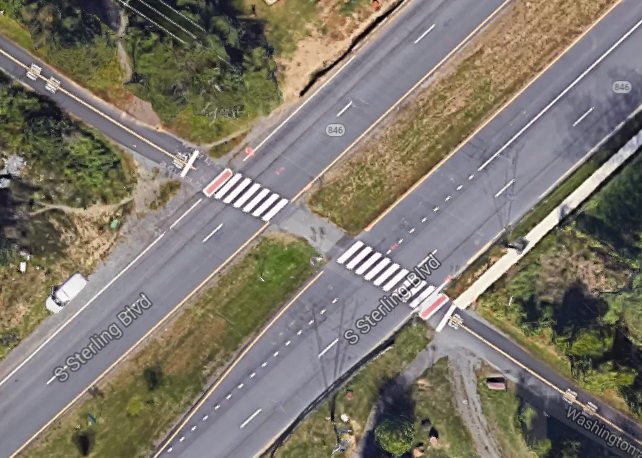 According to a May 2017 news release from the Sterling District Supervisor, the Loudoun County Board of Supervisors supported making this intersection safer for trail users: "The improvements currently being installed by NOVA Parks include the installation of a trail user activated rectangular rapid flashing beacon (RRFB) warning signal to alert motorists of an active crosswalk ahead." It's crazy that Loudoun police plan to ticket motorists for yielding to trail users. VA law, 46.2-924 states that "The driver of any vehicle on a highway shall yield the right-of-way to any pedestrian crossing such highway: 1. At any clearly marked crosswalk, whether at mid-block or at the end of any block;” This should be very clear. The law goes on to state that motorists also yield "3. At any intersection when the driver is approaching on a highway or street where the legal maximum speed does not exceed 35 miles per hour.” The later item does not refer to a crosswalk, but to an intersection. Over time this law has been misinterpreted by some to mean that unless the speed limit is 35mph or less, motorists aren't required to yield to users of a crosswalk. We are consulting with local transportation and legal staff regarding their interpretation of VA law and what they think about Loudoun Sheriff's officers behavior. Loudoun Sheriff's department does not have a good reputation when it comes to enforcing the law as it applies to bicyclists. In 2009 they ticketed MS 150 riders for not coming to a complete stop at STOP signs. In 2012 they ticketed Reston Century riders for not putting a foot down when stopping at a STOP sign. Update 28 July 2017: Today we spoke with Captain Hines, chief of the Eastern Loudoun Station, about the enforcement effort at this intersection. Captain Hines said officers were warning bicyclists to stop at the STOP signs at the crosswalk before entering and encouraged them to press the RRFB button before crossing. No tickets were issued. Capt. Hines said that some motorists were stopping in anticipation of bicyclists crossing. The bicyclists were approaching the intersection and had not yet stopped or pushed the RRFB button. We disagreed about whether this was illegal or not. It's possible that the motorists could be cited for stopping on a highway (46.2-888): "No person shall stop a vehicle in such manner as to impede or render dangerous the use of the highway by others, except in the case of an emergency, an accident, or a mechanical breakdown." From the police perspective, they are concerned that motorists who stop prematurely could be struck from behind. Or that when one motorist stops prematurely and a bicyclist continues into the crosswalk without stopping first, the cyclists could be struck by a second motorist who is not aware that a bicyclist is approaching. This is a legitimate concern and several cyclists have been struck in this situation. One way to address this concern is to do what other states have done, require motorists to stop at a crosswalk if the motorist in the adjacent lane has also stopped. In 2014 FABB worked with Del. Kaye Kory to get such a law passed, Reckless driving; passing other vehicles at intersections. (HB320). We may give it another try next year. We appreciate Capt. Hines taking the time to discuss this issue with us and look forward to working with his office to help educate motorists and bicyclists about safety issues. 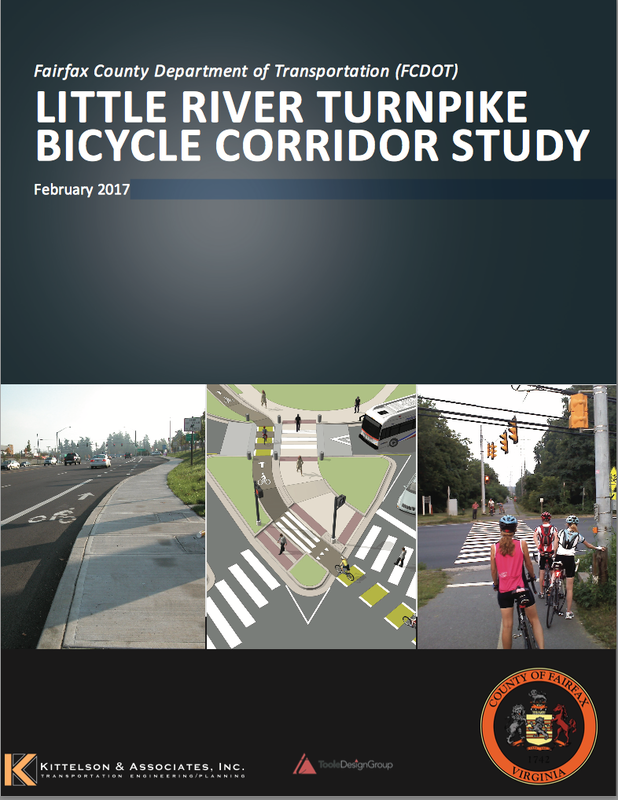 The Fairfax County Board of Supervisors this week will be reviewing for approval a package of bicycle and pedestrian transportation improvement projects developed from FCDOT's Little River Turnpike Bicycle Corridor Study, which covers portions of Braddock, Mason and Providence Districts. 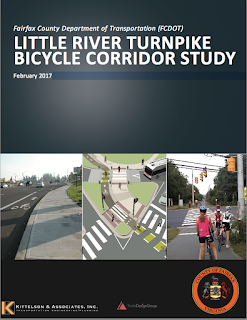 The Little River Turnpike study refined the county’s corridor design as envisioned in the 2014 Bicycle Master Plan. 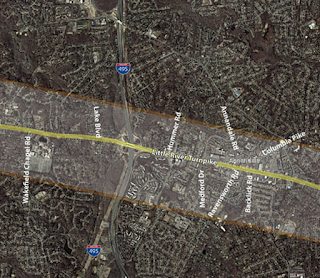 It resulted in short and long-term recommendations for bicycle facilities along the approximately seven-mile corridor through Annandale between the City of Fairfax and the City of Alexandria. The study emphasized improving connectivity, comfort, and convenience for bicyclists currently utilizing the corridor but also on developing a corridor where novice bicyclists will feel more comfortable and safe. The study provided the added benefit of enhancing pedestrian environments through complementary bicycle treatments, specifically shared-use paths, median refuge areas, and enhanced crossing treatments. The short and long-term recommendations were based in part on existing funded and planned projects, including: ongoing repaving projects on Little River Turnpike and adjacent streets; funded pedestrian walkways and crosswalks on Little River Turnpike; funded bike lanes connecting to Little River Turnpike (some of which were constructed during the study); and a long-term widening and streetscaping study for Little River Turnpike between I-495 and John Marr Drive. Among the improvements for the 13 Eastbound segments are a shared-use path along the existing shoulder with upgraded ramps and crosswalks between Lake Drive and Pineridge Drive and shared-lane markings (sharrows) between Pineridge Drive and Pinecrest Parkway with improved crossings at the I-495 ramps. The 14 Westbound segments feature an improved transition from the shared-use path to an existing frontage road between Wakefield Chapel Road and Lake Drive with ADA-compliant ramp, signage and sharrows. Additional sharrows will be installed between Pineridge Drive and Backlick Road. Funding for all of these improvements was previously approved. FABB members who live or ride in the Braddock, Mason and Providence Districts are encouraged to contact that Supervisor's office and express your support for these much needed bicycle and pedestrian improvements before the Board meeting on Tuesday, July 25. 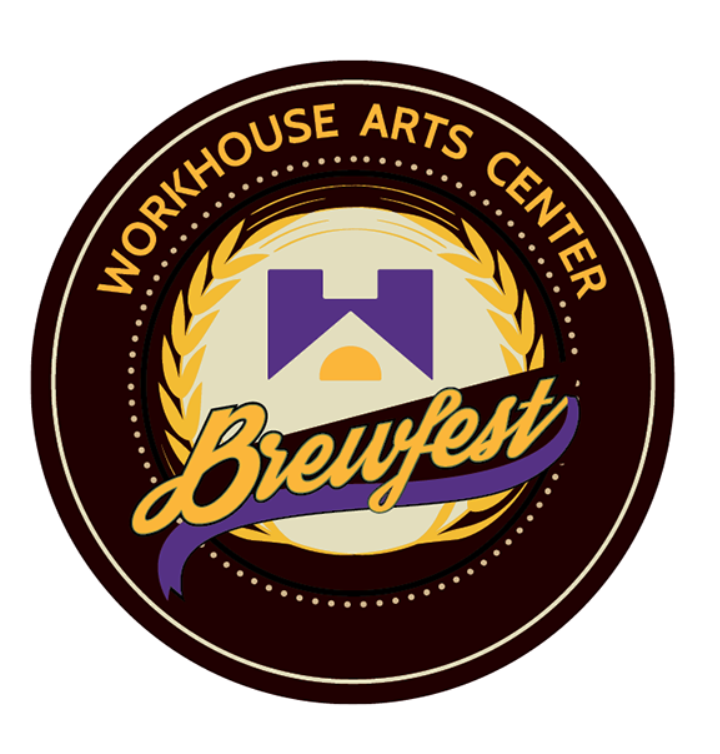 After a successful inaugural run, the Workhouse Brewfest in Lorton returns for a second year on Saturday, 12 August. FABB is again pleased to be partnering with the Workhouse Arts Center and Fairfax County to promote this great event and to encourage people to try riding there. 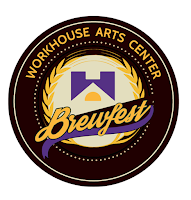 The Workhouse Brewfest will run from 1 pm to 8 pm and will feature food, live music, and, of course, beer. Craft brews from Northern Virginia and throughout the Commonwealth will be in the spotlight, and they will be joined by some fine beers from DC, Maryland, and West Virginia. The tasty products of a few distilleries and cideries also will be featured at the event. More than a dozen bands and performers will be on the two main stages. Plus there will be a number of workshops, demonstrations, and other fun how-to’s related to beer! There are three ticket types that you can buy for entry to Brewfest. You can also pre-purchase passes for on-site parking. Check out the website for details on and to purchase tickets. BONUS! FABB members can get a $5 discount off the ticket price by using the code: BIKE. Please spread the word, and we hope to see you there. 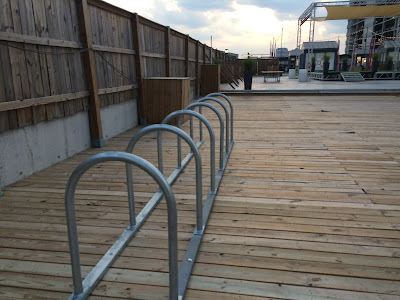 We've reported on the need for more free bike parking at the Wiehle-Reston East Metro station. 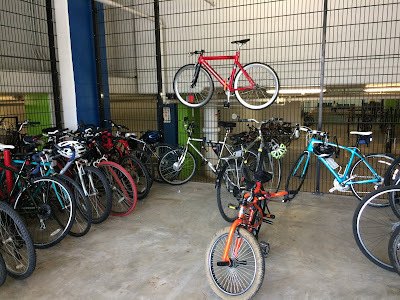 The free bike room adjacent to the paid secure bike room fills up on most days and bikes end up being locked to various objects in the room. One was even hanging from the fence recently. 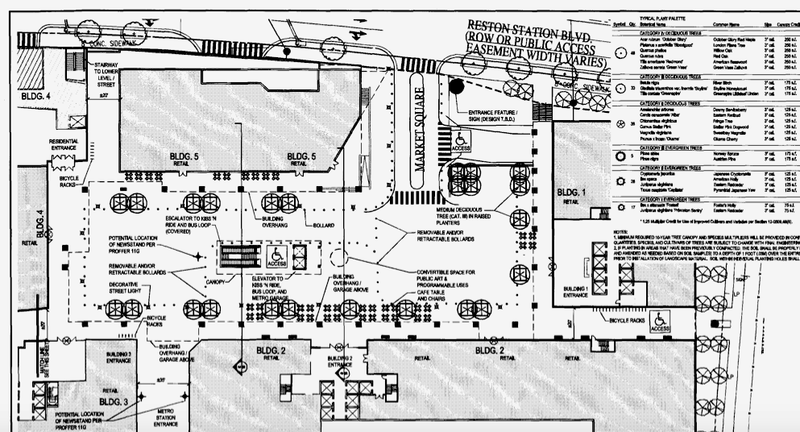 According to development plans (Sheet 11, page 177), bike racks will be placed on the plaza outside the station entrance. We're pleased to report that a new set of inverted U racks was recently installed near the bike share station. The racks are not covered but they do provide an option for overflow parking from the bike room. Thanks to Comstock and Fairfax County for working with us to install these racks. Overflow bike parking at Wiehle station. Capacity is 36 bikes. 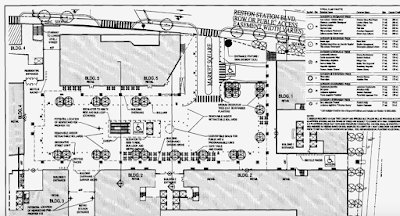 There were 54 parked on July 12.
showing proposed bike rack locations on plaza. Burke-resident Donald Curran and Springfield-resident Susan Demsko have been commuting to work for many years. Since 2015 and on each of the subsequent two Bike to Work Days they have been kind enough to tell FABB a little about themselves and give us updates on their thoughts and concerns. Donald tells us that he still enjoys riding, especially for the time it allows him to be outdoors. Susan, meanwhile, says that for her riding is a great way to exercise and reduce stress. She can’t think of a more healthful way to stay in shape. Both riders express the desire to see more bike lanes. Their morning commute to the Burke VRE station has gotten better over the yeas with the addition of new lanes and trails. Still, there are gaps on some of the local main roads, such as Rolling Road, Burke Lake Road, and Old Keene Mill Road, which could use bike lanes. The good news for the area is that improvements are being made in the area. New bike lanes are being added as part of the VDOT summer repaving program in accordance with the Bicycle Master Plan. This will includes stretches this summer along Greeley Boulevard from Carrleigh Parkway to Old Keene Mill Road and on Hillside Road from Rolling Road to Old Keene Mill Road. In addition, the Burke VRE Station is getting paths connecting it to nearby neighborhoods. Also, Rolling Road will soon get a sidewalk section that completes an important connection near Luthern Church. We look forward to seeing Donald and Susan next year and hearing their views on these and other changes in the area. FABB members in and around Falls Church should plan on attending a community meeting on Bikeshare this Thursday, July 20, at 7:00 pm. 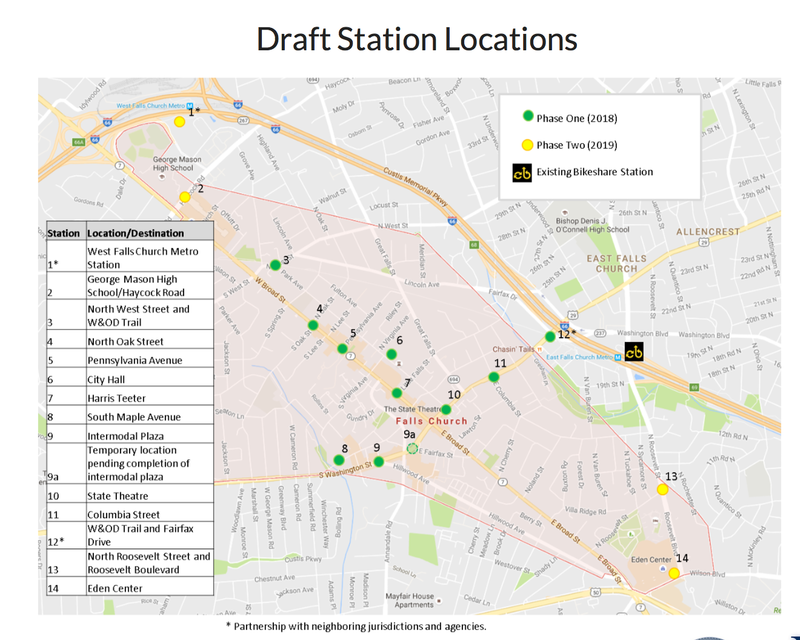 The subject will be the status of the project to bring Capital Bikeshare to Falls Church and to discuss the proposed station locations. The meeting will be held in the Council Chambers of City Hall at 300 Park Avenue. 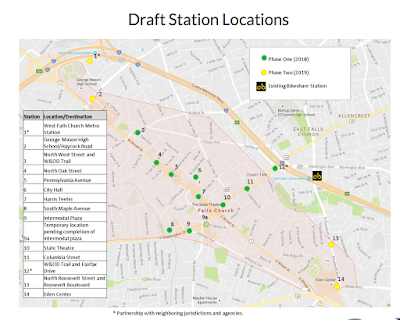 If you can’t make this meeting, you can still comment on the the draft station locations by using this crowdsource map. 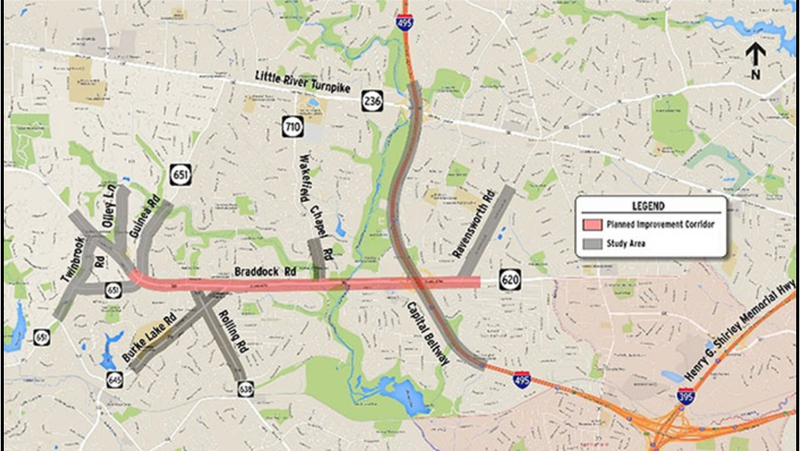 Hey, FABB members in the Braddock District, if you haven’t done so yet, be sure to share your ideas on the Braddock Road Multimodal Study with FCDOT and Supervisor Cook. You can leave your comments and take a brief survey on the study website here. All comments are due by Tuesday, July 25. The Northern Virginia Transportation Authority (NVTA) will host two more public meetings in Fairfax County on its draft TransAction plan. 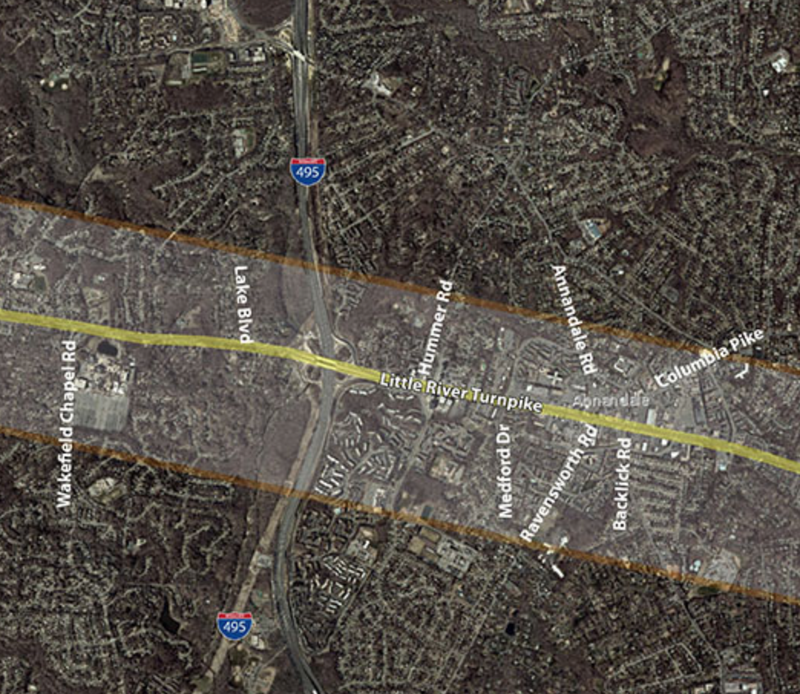 Join NVTA at 7pm on Monday, July 17, at Eagle View Elementary in Fairfax and on Tuesday, July, 18 at the South County Government Center in Alexandria to learn more and give feedback on transportation projects for Northern Virginia through 2040. TransAction is a long-range transportation plan for Northern Virginia that NVTA updates every five years in order to identify and prioritize regionally significant projects. For more information, including the project list, meeting locations and schedule, visit http://www.nvtatransaction.org. FABB will be holding its monthly meeting this Wednesday, July 18, at the Patrick Henry Library in Vienna starting at 7:30 pm. The meeting will feature the usual updates on FABB activities and the FCDOT report on current bicycle-related projects. We also will have officials from the Town of Vienna there to discuss planned bicycle transportation infrastructure improvements and bicycling initiatives. Please plan on joining us to learn about what you can do to help make bicycling better. 35TH ANNUAL RBC CENTURY, August 27, 2017! This year marks the 35th anniversary of the first Reston Bike Club Century. It will be on Sunday, August 27, with a Show and Go start from 6:30 am to 10:00 am at the Reston Town Center. The ride is better than ever, and this year's route has been tweaked to provide more variety and more tree cover whe. Registration is limited to 1500 riders and is filling up fast. Distances are the conventional century, metric century (62 miles) and metric half-century (31 miles). All riders receive a t-shirt with commissioned artwork by famous local artist, Dana Scheurer. Rest stops, after party, scenery, fun people-- this is the way to celebrate the end of summer! 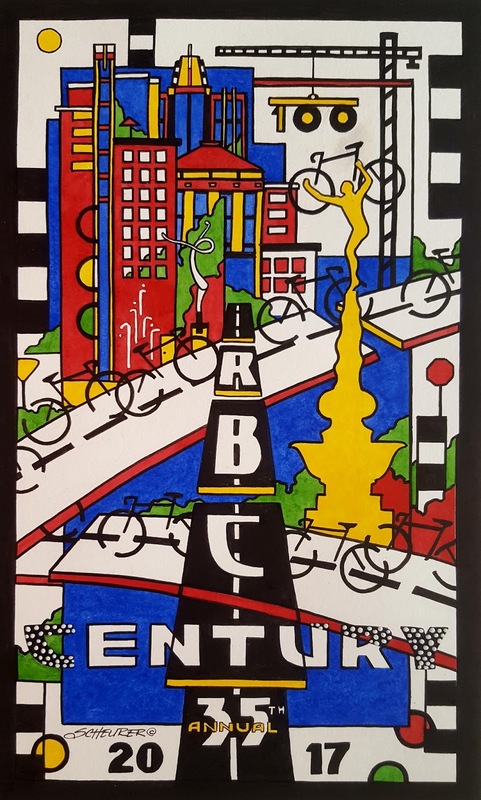 All proceeds of the Century enable Reston Bike Club to continue to support bike-related events and projects in Fairfax County. These include helmets and locks for local school kids, bike racks for local communities, support for triathlons for all ages, helmets and technical support for after school bike programs, and more. FABB is pleased to support RBC and encourages it members and others to register and ride. 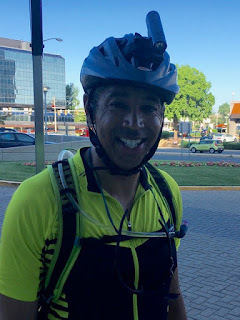 Daniel Graifer is dedicated bike commuter, regularly riding from his home near George Mason University to his job at Freddie Mac (the Federal Home Loan Mortgage Corporation) in Tysons. He told FABB that he rides for his health and to avoid traffic. With support from his employer, Daniel set up a commuting group at Freddie Mac that encourages people to ride to work and that has up to two dozen participants. Freddie Mack supports the group by providing lockers, showers, parking, and even a repair stand and tools. 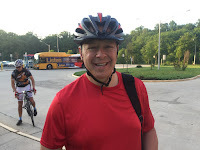 In response to our question about what he would like to change to make it easier and safer for you to ride, Daniel responded that more sharrows and bike lanes around Tysons would really help. As many of you are aware, FABB conducted a major advocacy campaign in May and June on the I-66 Outside the Beltway Project. In particular, FABB focused its efforts on gathering information about VDOT’s plans to include a parallel bicycle/pedestrian trail in the project and publicizing the need for public input to make the proposed trail better. 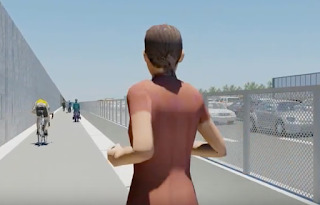 As part of these efforts FABB for the first time produced a video animation (see next item for details) that simulated a user’s experience on the trail to help people visualize some of the current plan's major problems. We also initiated a drive to have FABB members and others send email and written comments to VDOT and local, state, and national officials. FABB has been pleased with the public response and the wider interest shown in the issues we raised on social media and with local press outlets. 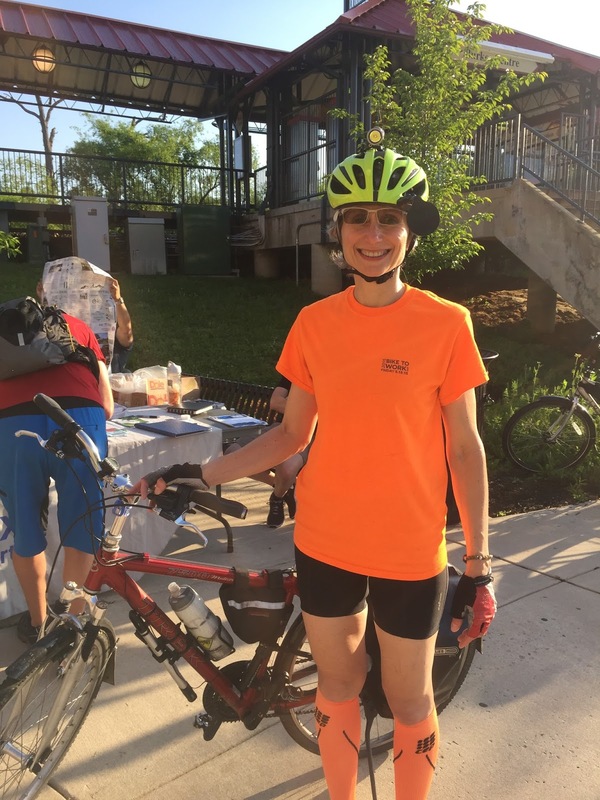 During the three public meetings in Oakton, Centreville, and Bristow in June, bicyclists were well represented by FABB officers and members along with many other interested riders. Alerted by FABB to concerns about riders' potential exposure to noise and pollutants and the limited access to surrounding neighborhoods that will be caused by the construction of significant trail segments on the highway side of the sound barriers, supporters of better bicycling in Fairfax County stepped up and spoke out. As important, throughout the past two months FABB maintained ongoing contacts with VDOT to gather information, clear up details, and present our concerns and ideas. 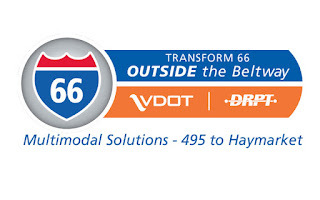 VDOT has our appreciation for its openness to our efforts to provide constructive criticism. We’re not finished yet. Design Public Hearings are tentatively scheduled for this fall. This will be one more chance for FABB members to push for a well-designed shared use path that will provide a safe, healthy, and enjoyable experience for trail users of all ages. In June FABB produced its first animation video with Claudio Oddo, a computer graphic animator who specializes in photo-realistic environment modeling. 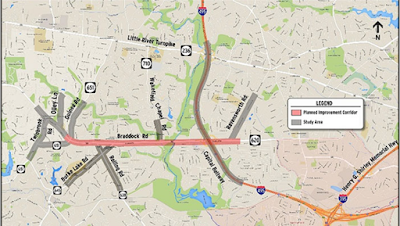 The video was produced in under five days using VDOT data, but it did not represent all of the details of the proposed I-66 expansion. Given constraints of time and resources, the highway was only a rough approximation based on available documents. But, after making a correction for a change to the barrier between the trail and highway, we think the animation does a great job of simulating a bike rider’s experience on the trail. In particular, a viewer can get a clear sense of how close the traffic is to the trail, the absence of grade separation, and the absence of natural barriers and cover on the very exposed trail. The video accomplished our main goal, which was to draw attention to the parallel trail issue and get more people involved. FABB greatly appreciates Claudio’s excellent work and wants to thank all of our supporters, whose donations make it possible for us to try innovative ways (innovative for us, anyway) to advocate on your behalf. FABB will be hosting an upcoming Capital Trails Coalition Meeting on 27 July at the Northern Virginia Regional Commission, Suite 200, 3040 Williams Drive in Fairfax. 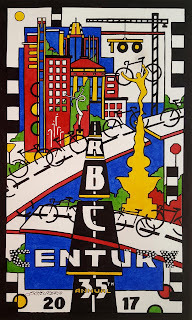 FABB joined the CTC this year to be part of a collaborative effort among numerous regional public and private organizations, agencies, and citizen volunteers to advance the completion of a world-class network of interconnected multi-use trails in the DC metropolitan region. FABB officers Jeff Anderson and Sonya Breehey will be leading an 8-mile bicycle ride workshop for CTC members and others prior to the meeting. The ride will start near the Vienna Metro South Parking Garage. Participants will have the opportunity to see and discuss the Vaden Drive and Circle Tower Park trails, the Picket Road shared use path, Thaiss Park and the newly installed VDOT Pickett Road underpass, and segments of the Gerry Connolly Cross County Trail. The pre-meeting ride workshop will start at 11:00 am and the meeting will begin at 1:00 pm. About 35 bicyclists from the Capital Region are expected to attend, and FABB members are encouraged to join in to learn more about the coalition and to meet other committed bicyclists. 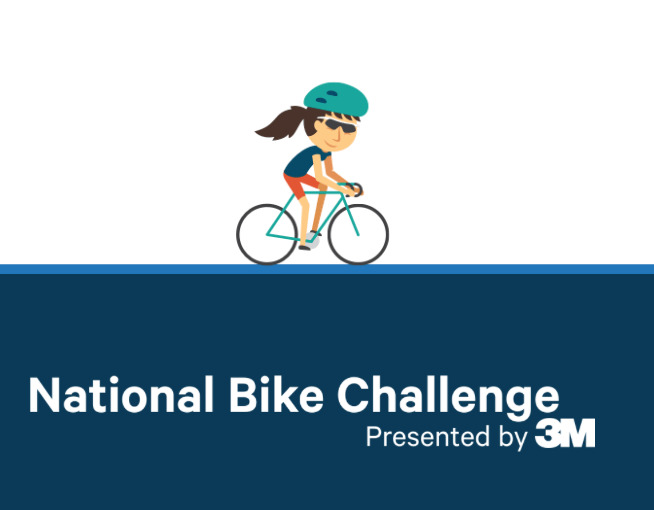 Participants should plan on parking their vehicles at the Vienna Metro South Parking Garage or riding METRO with their bike. They can bring a bag lunch or there will be an opportunity to buy lunch at the Mosaic District shopping area. Please send an e-mail to info@fabb-bikes.org if you have any questions or plan on attending. Tour de Fat is Coming! Now in its 17th year, New Belgium Brewery’s charity event, Tour de Fat, returns to DC on July 22, and FABB will again be participating in the festival as our major fundraising event for the year. Tour de Fat has changed this year to accommodate holding the event in more cities, presenting bigger entertainment acts, and reaching its goal of generating more money for non-profit partners like FABB. The tour has moved to a paid, ticketed model and rather than an all-day event, it will be held from 4:00 p.m. to 9:00 p.m. next to Nationals Park. All tickets are for general admission and cost $25 (kids under 12 enter for free). The price will increase to $30 two weeks prior to the show, so get your tickets early. In addition to the usual cast of circus performers, vaudeville acts, and magicians, the DC Tour de Fat will feature the rhythm and blues band Vintage Trouble. There will not be a bike parade this year, but attendees are still encourged to wear wild costumes! FABB has again volunteered to check identification and issue the wristbands needed to purchase beer. We plan to run two shifts of 2-1/2 hours each and need 15 volunteers for each shift for a total of 30 volunteers. In addition to helping FABB earn its share of the gate, our volunteers get free admission to the Tour and will have time to experience some of the music and fun. This is FABB’s best opportunity of the year to raise needed funds for our work on making bicycling better in Fairfax County. Please mark your calendars for July 22 and plan on joining us at the Tour as a volunteer or as just a music- and beer-lover. Also, please encourage your friends and family to attend this wonderful, family-friendly festival. More funds are going to trail maintenance. VDOT since 2015 has made repairs to parts of the Fairfax County Parkway Trail, but it plans to pave the entire Parkway trail this summer. Because recent trail repairs have prompted cyclists’ complaints about quality and the lack of notice of closed trail segments, FABB will be working with VDOT to ensure trail closures are publicized to help cyclists safely navigate construction areas. No dedicated staff or funding (yet). VDOT could not make a commitment on these requests. Still, we are encouraged that funding has been available recently, and FABB will continue advocating for sufficient funding to repair our neglected trails. 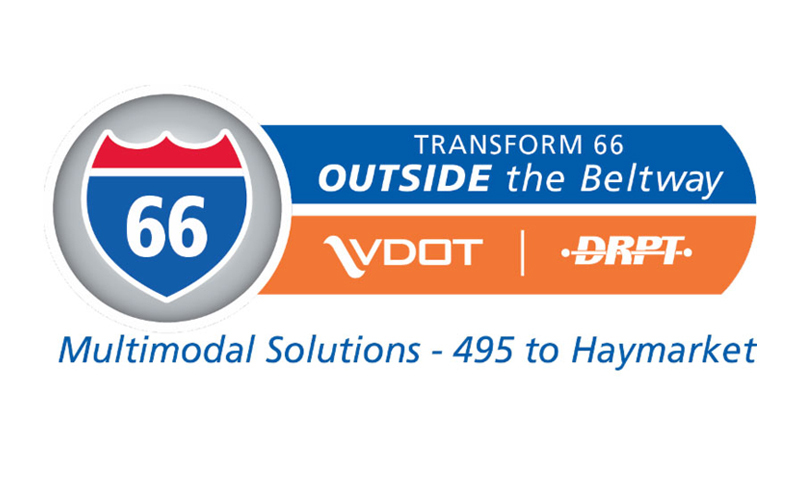 VDOT is responsive to identified repair needs. Cyclists who come across a repair issue can and should report the problem on the myVDOT website. This is the best way to report a maintenance need, and, if safety is a concern, the requester should state this in the comment box on the form. Identifying trails. 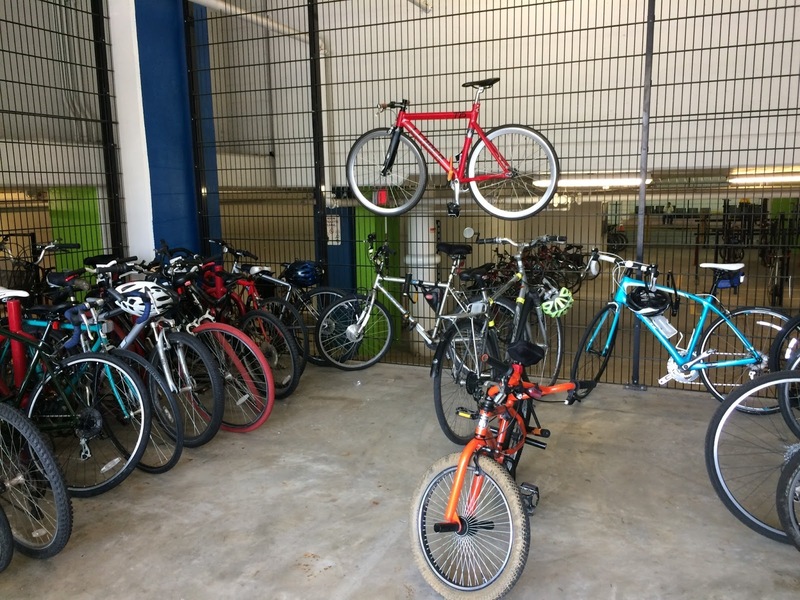 To help it prioritize trail maintenance work and better plan for needed trail and bike lane connections, VDOT is finalizing a contractor-produced bicycle facility inventory that identifies VDOT-owned bicycle and pedestrian facilities along with ones that VDOT has agreed to maintain. This project should be completed by the end of the year. A “best practices” manual and volunteers. FABB offered to prepare a list of suggested best practices for maintaining bicycle facilities for use in a proposed statewide manual. VDOT staff also welcomed groups adopting a trail or performing volunteer maintenance service on it. FABB, as you know, is participating this year in the National Bike Challenge, which is organized by the League of American Bicyclists with sponsorship by 3M, to help encourage current and new bicyclists to get out and ride. FABB started out strong and was among the top 10 advocacy organizations in the nation during the Challenge’s first few weeks. We’ve since dropped back to 18th in the rankings as of late June. So, if you’ve already registered, get out there and ride. If you haven’t signed up, there is still plenty of time. The “Challenge Period” goes through September 30. 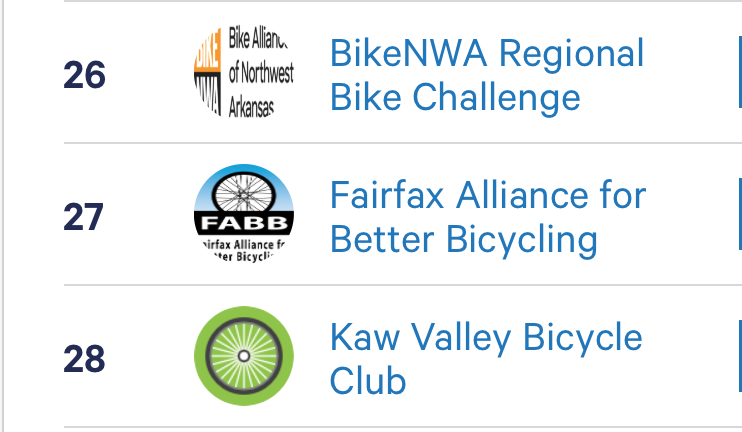 Just go to the National Bike Challenge website, follow the directions, and start adding your miles to FABB’s tally. FABB wants to thank Bikes@Vienna for their donation in support of our participation in the National Bike Challenge. FABB’s bimonthly Board Meeting will be held on July 6 at the Oakton Library and, while space in the meeting room is limited, members are invited to attend. FABB’s monthly meeting in July will be back at the Patrick Henry Library in Vienna on the 19th. Rather than a general meeting, however, our tentative plan is to focus on bicycling improvements, needs, and plans in and around the Town of Vienna. The August monthly meeting, meanwhile, will be at the Mason District Governmental Center in Annandale on August 16 and will cover the Providence and Mason Districts. Please plan on joining us. 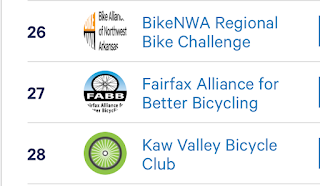 We now have the official volunteer signup link, so please join FABB in participating in the region’s biggest bike party of the year, the Tour de Fat. FABB is going to be working with WABA to provide two shifts of 15 volunteers each to handle IDs & wristbands for the event on Saturday, July 22, from 4:00 – 9:00 pm. As of July 9th we already have 10 volunteers, so we just need 20 more. Please help out by going to the New Belgium Brewery Tour de Fat Volunteer page and signing up for either Shift 1 (from 3:00 - 6:00 pm) or Shift 2 (5:30 - 8:30 pm). In addition to the joy and satisfaction that comes from helping FABB earn money for its advocacy efforts, volunteers get free admission to the event for the shift they are not working (Full Ticket Price: $25), free admission to the event for a guest (Full Ticket Price: $25), one free beer token (Regular Price: $5), and a FABB t-shirt! So, please sign up and please spread the word to your friends and family about Tour de Fat and the awesomely fun time to be had. Check out the Tour de Fat website for details on location and events. The Discovery Trail map developed by Fairfax County Park Authority is a fun way to learn more about the history of Fairfax County during the county's 275th anniversary. The Park Authority is holding a contest this year, encouraging residents and visitors to visit at least 8 of 12 parks depicted on the map. Participants can win prizes and are entered into a drawing to win a bike donated by Spokes, Etc. and Trek. We think the best way to visit these sites is by bike, if there's a safe route. We used google maps bike directions to create a 60-mile route between 9 of the 12 parks. We haven't ridden the route and can't vouch for whether or not the included roads are safe. If you do try to ride between the parks, let us know in the comments section about your route. Here's info from Fairfax County about the Discovery Trail map and contest. Which U.S. President made sure one of Fairfax County’s largest parks would be preserved for recreational purposes forever? Which county historical site served for more than 150 years as a church for an integrated congregation starting in the 1790s? Which location once operated a licensed still, and which was known for illegal moonshining? The answers to these questions and more can be found in the Fairfax County Park Authority (FCPA) Discovery Trail Map 2017– celebrating the 275th anniversary of Fairfax County. Now in its fourth year, the popular summer activity encourages participants to explore 12 distinctive parks and discover their history. 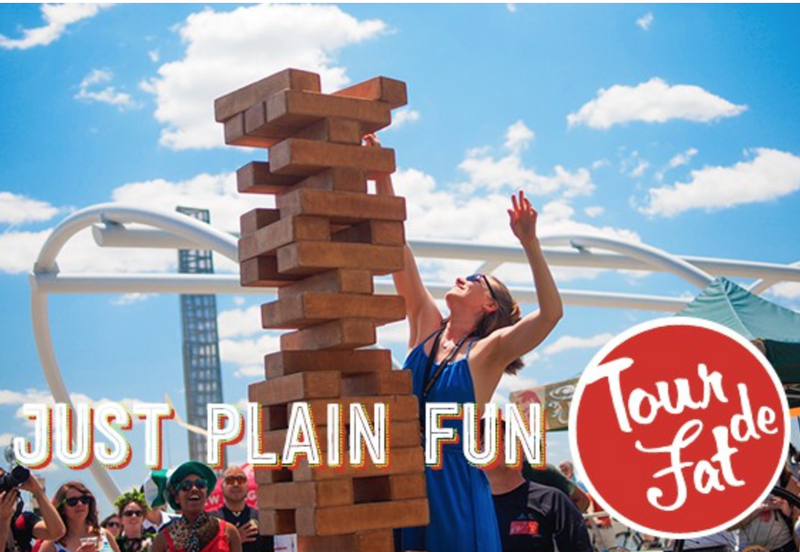 This year, both children and adults are eligible to win prizes for learning and having fun! Participants who visit eight sites will receive a prize packet valued at $93 full of nine tickets to summer park amusements such as boat, train, wagon and carousel rides, mini golf and camping. Prize pack winners are also eligible to enter a drawing for one of four bicycles and safety helmets donated by Spokes, Etc. and Trek through the Fairfax County Park Foundation. In celebration of Fairfax County’s 275th anniversary, the 2017 map also introduces another way to learn, have fun and win through Instagram. Lord Fairfax VI, the only English titled nobleman ever to live permanently in the American colonies, will “visit” parks along the Discovery Trail throughout the summer. Participants who spot him are encouraged to take a selfie with him and post it to Instagram: #WhereIsLordFairfax. From the photos posted, judges will select one winner each week to receive a choice of two RECenter passes or two mini golf passes valid at any FCPA RECenter or mini golf course. Check the Park Authority’s Facebook page for weekly clues about where to find Lord Fairfax VI. Discovery Trail Maps are available at any staffed Fairfax County park, RECenter, nature center, historic site and golf course; any Fairfax County Public Library; and all five Northern Virginia Spokes, Etc. stores while supply lasts. Maps are also available online at Discovery Trail Map. Instructions for participating in the activity are included on the map. The promotion runs from Saturday, May 27 through Monday, Sept. 4, 2017. Parents/guardians of youth bike winners and one adult bike winner will be notified by e-mail and/or phone. Bike winners will be publicly announced in September. For more information contact the Public Information Office at 703-324-8662. The Fairfax County Department of Transportation is looking to recruit volunteers to help count non-motorized road and trail users in September as part of an annual national data gathering project. No previous counting experience is necessary, and voluntary in-person training and digital training materials will be provided. This opportunity is suitable for those under age 18. The minimum age to volunteer is 14 and those under 16 need a parent with them. 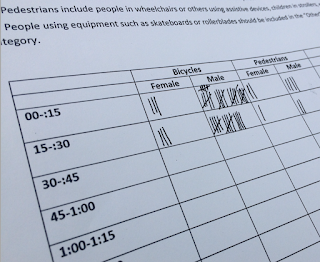 Volunteers for the National Bicycle and Pedestrian Documentation Project will play a critical role in: 1) building a robust and public database of pedestrian and bicycle use; and 2) identifying local and national trends in biking and walking. These counts are essential for advancing active transportation because they inform planning and engineering professionals on the diversity of our transportation and recreation habits. If you are interested in being part of future bicycle and pedestrian counts, please apply to Nicole Wynands at 703-877-5625 or Nicole.Wynands@fairfaxcounty.gov. Doreen (left) and Annette (right). Good friends Doreen Grzelak and Annette Reichenbaugh used Bike to Work Day 2017 as an opportunity for some outdoor fellowship. 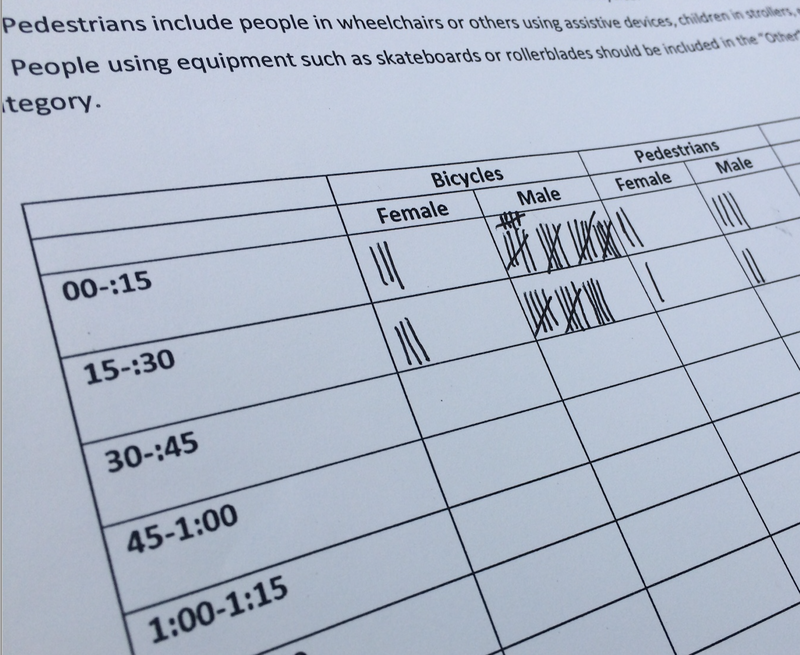 They answered FABB’s brief survey questions at a BTWD pit stop in Herndon. Annette: Same here. The W&OD Trail and around my home in Fairfax City. Doreen: To be with friends. Annette: I agree. I like riding for its social aspects, but I also ride for the exercise. We hope Doreen and Annette will join FABB on one of our next social rides. 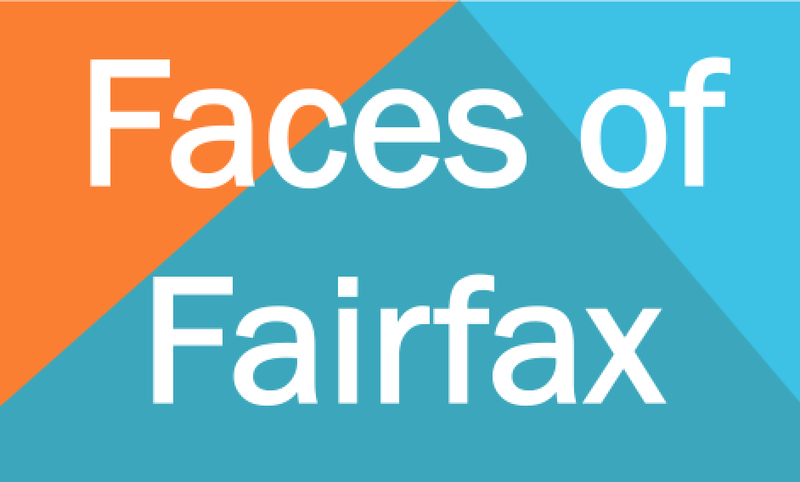 FABB regularly conducts social rides around Fairfax County. We do this not only to meet people and have fun but to share our knowledge about safe routes and point out newly added bicycling infrastructure. Please watch this blog and our social media for announcements for our next planned ride. Since 2015 FABB has taken advantage of Bike to Work Day to collect photos and stories of local bicyclists. Our goal has been to personalize Fairfax County’s bicyclists for the larger public. 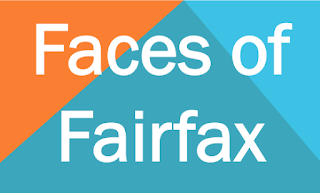 Once again, over the next few weeks, FABB will be posting what we modestly call “Faces of Fairfax” to show the breadth, depth, and humanity of cyclists here in northern Virginia. 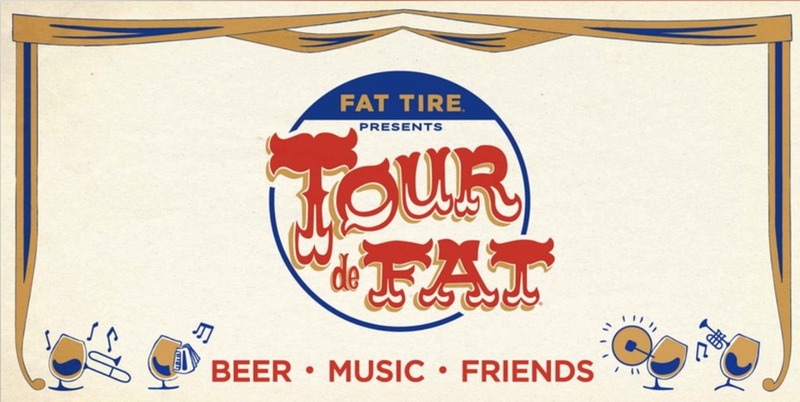 FABB's major fundraising event of the year is coming up this month, so please mark your calendars to attend and perhaps even volunteer for New Belgium Brewery’s Tour de Fat. This charity event featuring beer, music, friends, and fun returns to DC on Saturday, July 22. FABB has again volunteered to check identification and issue the wristbands needed to purchase beer. We plan to do two shifts of 2 /12 hours each and need 15 volunteers for each shift for a total of 30 volunteers. 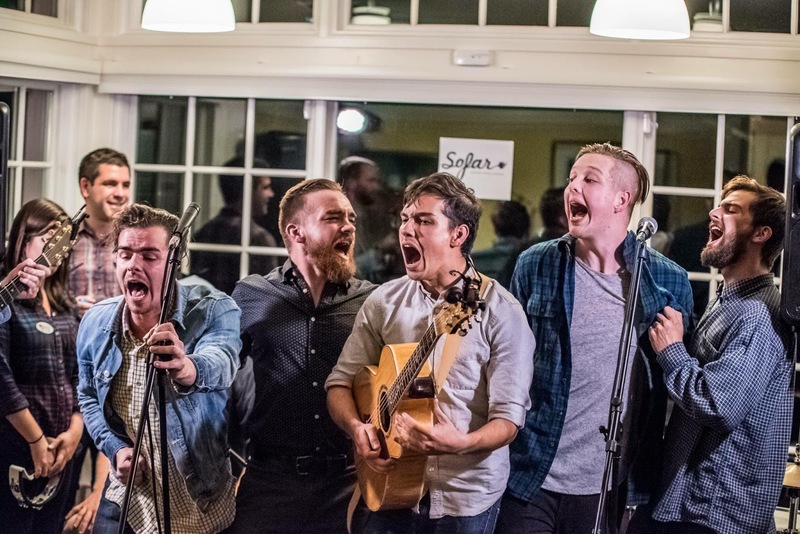 In addition to helping FABB earn its share of the gate, our volunteers get free admission to the Tour and will have time to experience some of the awesome music and fun. Tour de Fat has changed this year to accommodate holding the event in more cities, presenting bigger entertainment acts, and reaching its goal of generating more money for its non-profit partners like FABB. The tour has moved to a paid, ticketed model and rather than an all-day event, it will be held from 4:00 p.m. to 9:00 p.m. next to Nationals Park. All tickets are for general admission and cost $25 (kids under 12 enter for free), rising to $30 two weeks prior to the show (get your tickets early!). 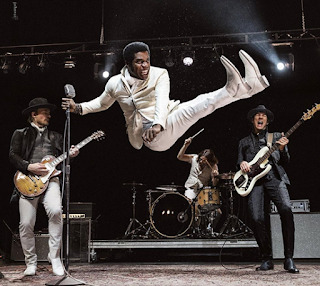 In addition to the usual cast of circus performers, vaudeville acts, and magicians, the DC Tour de Fat will feature the rhythm and blues band Vintage Trouble. Unfortunately, there is no bike parade this year, but wearing wild costumes is still encouraged. This is FABB’s best opportunity of the year to raise needed funds for our work on making bicycling better in Fairfax County. Please plan on joining us at the Tour as a volunteer or as just a music- and beer-lover. Also, please encourage your friends and family to attend this wonderful, family-friendly festival.